In 2016, the ST Foundation strengthened its attention in improving the efficacy and efficiency of its mission bridging the digital divide among the most disadvantaged people in both developing and developed countries. The Digital Unify Program offered free computer access and training to 403.150 beneficiaries since its inception and as of December 2016. On November 30 2016, the ST Foundation’s Board members organized a meeting by teleconference to name the new Treasurer. They acknowledged the resignation of Mr. Mario Arlati from his duty as board member and Treasurer of the Foundation, due to personal motivations. Further, the Board elected Mr. Giuseppe Notarnicola as the new Treasurer. Board members and the ST Foundation’s staff have warmly welcomed Mr. Notarnicola onboard. Update on DU: 2016 a year of achievements. 2016 was a successful year that has seen the continuous implementation of the model lab concept in the countries of intervention, highlighting a constant positive trend along the years. The program grew steadily along the year in both ST and non ST Countries. 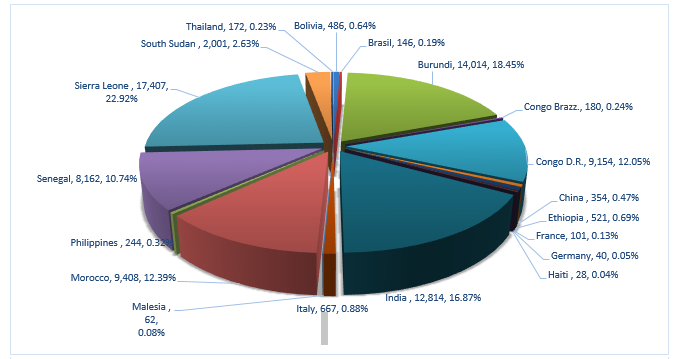 Ethiopia, Haiti and Thailand became fully operational in 2016. Since the inception of the program, we trained 403.150 trainees. The expansion’ strategy of the ST Foundation, approved by the board members in 2012 and based on the two main axis of maintaining the focus in Sub-Saharan African countries while reinforcing the importance of the presence of the Foundation in the ST countries, was continued also in 2016. In fact, the DU program was boosted, on one side, in Africa with a particular attention to Sierra Leone where the activities went back to normality after the Ebola pandemic. In addition, the Foundation reinforced its presence in ST countries, with a particular attention on increasing its presence in China, France, Germany, India, Italy, and Thailand. On April 12 during the board meeting it was decided not to continue the fundraising strategy as in the past, i.e. presenting grant proposals with the support of a specialized external agency that worked with the Foundation all along 2015 since the results were well below expectation.For the first time in September, following the ideas of the HR department of the ST plant in Agrate (Italy) and of the local group of volunteers we organized a run, called “the Energy Run” to raise extra funds and to increase the awareness on the Foundation and its activities. With the precious support of the ST plant and of the local volunteers, the results of this pilot event went beyond the initial expectations with more than 500 participants to the run and over 12.000 euros collected during the occasion. On the base of the very good results, it was planned to repeat the initiative also in 2017. The good collaboration between the ST Foundation and the ST Corporate External Communication team went on with extremely positive results also in 2016. Thanks to the precious support of the ST team, the 2015 Annual Report dedicated to update the internal and external public on the performance of the DU program was prepared issued and distributed to show the insights of our activities in the intervention areas. The communication team also supported the ST Foundation to prepare brochures devoted to the Italian and Moroccan public. The MOU that launched the opening of a new country was signed in December 2015 among the ST Foundation, Fondation pour une solidarité international (where FSI is a Swiss based Foundation that donated 10.000 CHF to support our projects in Congo DR and Burundi) and Education for Sustainable Development (where ESD is an Ethiopian Charity Organization working in the area of pre-school education, quality primary education, women livelihood support and youth vocational skill training). As a result, a DU Center was set up in June at the Community Information and Technology Center in Debre Berhan, located 130 Km from Addis Abeba. The ST Foundation was responsible for suppling the equipment, set up the lab and organizing the Train the Trainer course while ESD, supported by FSI, manages the project locally covering all the running costs including the internet connection fees. In November in Kuala Lumpur, a program to enhance refugees’ access to Information Technology was launched in collaboration with a specialized community organization, the Coalition of Burma Ethnic Malaysia (COBEM). Thanks to this collaboration, 200 refugees from Myanmar will receive free computer training and access to the necessary equipment. The partnership was strongly facilitated by the UNHCR.During the ceremony for the signature of the Convention, Richard Towle, UNHCR representative in the country said, “We live in a globalized and technological era and if refugees are not connected, they will be left behind. The problem for refugees is that they are largely invisible. While grateful for the opportunity to be here in Malaysia, they remain unrecognized and have limited access to legal employment, education and skill training. A program such as this helps refugees become part of the wider global community, empowering them to be more self-reliant, and expanding the protection space for refugees overall”.The ST Foundation is proud to take part in the project that will contribute to ease the already difficult social situation in which many refugees live, and to concretely approach the social issue of immigration that is now, more than ever, very dramatic in many world areas both in developing and developed countries. Along 2016, the DU program has been strongly reinforced in France. Two new collaborations have begun. In fact, in June the Montrouge project was launched with the signature of a MOU between the Municipality of Montrouge, Montrouge Habitat, Espace Colucci, Acadomia, Secours Populaire de Montrouge, Initiative Emploi, and Ecoute Chômage. The key target of the project is to reduce the Digital Divide problem in the Montrouge Municipality, 12 kilometers from Paris. The project has been realized with the commitment of the ST Paris office and with the precious support of its site manager Jean-Luc Estienne. The expansion of the activity in France was also reinforced by the signature of a second MOU with Sport Dans La Ville, association based in Lyon whose scope is to foster social and professional inclusion of young people boosting all aspect of education. In April, the board members approved a collaboration with ALTIS (research center of the Catholic University of Milan) to develop a study on the DU Program’s impact in the intervention areas. The project has been designed to have a multi-stakeholder perspective, involving the key parties that take part in the Program (i.e. : students, local staff, teachers, partners and families). The project will use quantitative methods, envisaging the submission of structured questionnaires to trainers, students and students’ families of selected DU centers, and it will be completed by a qualitative analysis developed through ad hoc interviews to specific stakeholders’ samples. The main target of the initiative, that will be carried out in Q1 and Q2 2017 in three selected countries (i.e. : Burundi, India and Morocco), is to understand the economic and social returns produced by the DU program. The evaluation will allow the development of an ad hoc “data collection and analysis model” that will be integrated into the already existing online reporting system, allowing the Foundation to be autonomous for further evaluations in all intervention areas. The process of fine-tuning among the Foundation, the country mangers of the three selected countries and the Catholic University, together with a pilot project was finalized in December 2016. On the base of the results, the kick of the project has been scheduled for February 2017. The ST Foundation has officially introduced the online reporting system that became mandatory starting from January 1. Thanks to this key tool the Foundation can guarantee a stable control on the activity giving the possibility of implementing corrective actions, if needed, in real time, verifying the status of the centers throughout the world, indicating for instance if internet (key tool for our courses) is well functioning or if we have low performance trainers. In March Ruben Sonnino and Mauro Zappa, ST employee based in the Agrate plant, organized a mission to launch the first lab in Haiti. The lab is located in a complex managed by the Salesians in Port Au Prince were they provide school for 4.000 needy kids. In this location, an ICBF course was organized to empower the local trainers. 20 people took the class and got their certificates. With their support, the Foundation will be able to give its support to fight the digital divide in this new and very disadvantaged intervention area. In May, Enrico Riva organized a one-week mission to Sierra Leone with the following purposes and namely to: carry on an operation review with the local representative analyzing the actual status of the 18 labs that are present in the country; personally visit 9 labs meeting the partners and trainers to audit the activities that are carried out and to gather their feedbacks and eventual needs and/or observation; and meet AFCOM, internet provider, that is currently giving us internet for free in all the STFoundation labs (with a yearly correspondent saving of 3’960 USD per center). In May, Patrice Chastagner and Giovanna Bottani left for a week mission to Morocco. The main purposes of the trip were to: organize an operations review with the support of the local representatives, Farah Arron and Houmad Boukdir; present the new organization, that envisages to have only one representative starting from June; meet the representatives of the Ministry of Interior to understand if the Convention, we have with this partner, can be renewed; audit the Casablanca’s labs that belong to the new smart city’s project; participate to a certificates distribution’s ceremony at the Fondation Orient Occident (FOO). The recognized classes had the peculiarity of being composed of 80 Imams coming from different African countries. In June Mauro Decca visited Ethiopia and Congo DR. The first stop was Ethiopia where Mauro was accompanied by René Munyembari, former country representative of Burundi and experienced ST Foundation trainer since 2009. The purposes of the visit were to: launch the country as a new intervention area; install a lab in the Community Information Technology center in Debre Birhan; organize a Train the Trainer course to start actively operating and cascading the DU program. For this scope, six people attended the course and became trainers. The second country to be visited was Congo DR. During this trip Arnaud Arakaza, the new representative of Burundi and excellent trainer, supported Mauro. The scopes were to: visit the 11 labs of the country, verifying that everything was functioning appropriately; start boosting the initiation of the second phase of cooperation where the partner is supposed to become gradually financially independent; better introduce Arnaud to the field since he will be not only responsible for Burundi but also for visiting and overviewing the neighboring countries where the ST Foundation has plans or DU activities. In June Kamal Deep Jain and Chhavi Bajpai visited Thailand in order to coordinate an ICBF course at the Pistorio Foundation Lab. This step underlined a new partnership leading to explore a new country of intervention. During the 3 days 11 new trainers were trained and are now ready to be the engine for further developments in the country. In June Alain Dutheil visited Montrouge (France) to sign a Convention with the Municipality, Montrouge Habitat, Espace Colucci, Acadomia, Secours Populaire de Montrouge, Initiative Emploi, Ecoute Chômage. Alain Dutheil represented the Foundation at the ceremony. The initiative is focused mainly on offering free informatics education to disadvantaged people like immigrants, unemployed, dropped outs from schools etc. In November Mauro Decca organized a mission to Senegal to accomplish the following tasks and namely to: discuss the ongoing collaboration with the Anpej; present the second phase of collaboration; review the activities carried out with our second historic partner i.e. CNID, presenting also in this case possible methods to approach the second phase of collaboration with the gradual reduction of the financial contribution of the Foundation; present the T4K Program at the Thies center that has always been very active and well engaged; and collect in the same center, further ideas on how to reach the gradual financial independence of the Labs. In December, Enrico Riva organized a mission to Sierra Leone. The key achievements of the trip were to: set up four new computer centers; set up of the offices of the newly established NGO where the “ST Foundation Sierra Leone” will have its base; explain how to pass to the second phase of collaboration with the related contribution’s reduction for 6 centers; and terminate the financial support of the old centers (i.e. Albert Academy Lab, Annie Walsh Lab, Fawe Waterloo lab) while maintaining a minimum level of activity.